Shows about immigrants are hardly new ground in theater, but they’re seldom as bewitching as the Canadian import Old Stock: A Refugee Love Story. This quirky one-act musical—more like a concert with accompanying dialogue—uses playwright Hannah Moscovitch’s Jewish-Romanian great-grandparents’ refugee romance in early-20th-century Montreal as the framework for a series of rollicking neo-klezmer songs written by director Christian Barry and performer Ben Caplan, who serves as narrator and, occasionally, God. 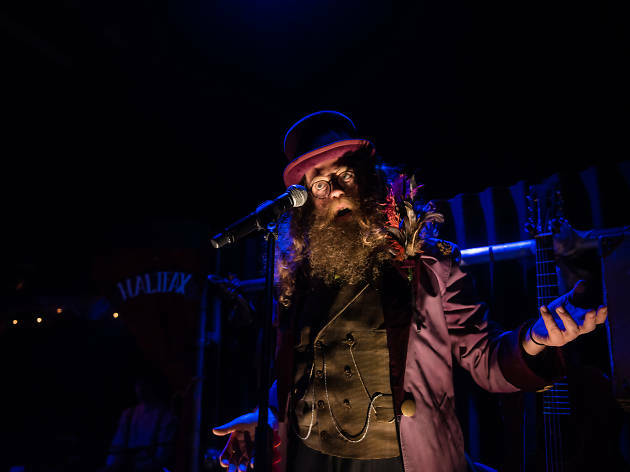 With his purple Willy Wonka suit, unkempt cantor’s beard and Tom Waits–style growl, Caplan is a bit like gefilte fish: an acquired taste. But there’s something shrewd about his carnival-barker delivery. From the moment he emerges from the claustrophobic shipping-container set at the top of the show, he sells this old family folktale as our collective history, though the politically charged and profanity-laden lyrics remind us that not every refugee story ends happily, especially these days. As they negotiate their new relationship in a new homeland, lovestruck Chaim (Chris Weatherstone, who wails on woodwinds) and young widow Chaya (Mary Fay Coady, a mean fiddler) alternate between humor and heartbreak. Troubles in the Old Country almost broke them and discrimination tests them on this side of the Atlantic. How will they make it through? You’ll find yourself wondering how anyone did. 59E59 Theaters (Off Broadway). Music and lyrics by Ben Caplan and Christian Barry. Book by Hannah Moscovitch. Dir. Barry. Starring Caplan. Running time: 1hr 20mins. No intermission.